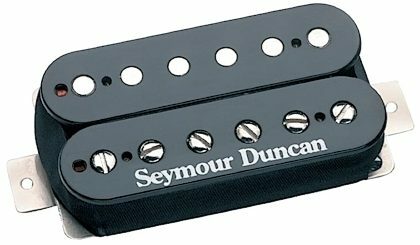 The Seymour Duncan TB-16 59 is a hybrid humbucker (F-Spaced) consisting of coils wound with different wire gauge and DC resistance. This pickup features a medium output and warm tone with lots of harmonics. Versatile blend of classic and modern tones. Recommended for blues, rock, pop, and classic rock. Unique hybrid construction pairs a '59 screw coil with a Custom slug coil for crisp, clear highs, powerful lows, and a complex midrange growl. Use in the bridge position with any vintage-output neck humbucker, such as the '59n or the Alnico II Pro. For any well-balanced dual-humbucker guitar. Works equally well with maple and rosewood fingerboards. Overall: I have used JB/Jazz and 59 combos in all my guitars. I decided to upgrade my Gibson SG 70's Tribute pickups and chose 59 neck and 59/custom in the bridge. Don't get me wrong, I'm a huge fan of 59s but needed some beef for a SG pickup. Holy snikes! this pickup is a beast and my new #1. Watch the SD video - it's the tone of a 59 with some cajones. Excellent growl with outstanding note articulation. Power chords have power and the highs are angelic with out that biting treble in most pickups of this magnitude. If you chose this pickup you will be in tone nirvana. Only negative is that I didn't use a split coil config. "** WARNING**' 59/Custom Hybrid Obsession WILL RESULT!" Overall: I haven't put down my guitar since first installing these puppies! I installed them in parallel humbucking "mode", and did a special 4 volume style of installation letting me have access to all 4 single coils of my two humbuckers (the other is a JAZZ (Seymour Duncan) in the neck). I used 2 concentric pots and a 3-way toggle. The '59 is VERY twangy in it's position, and good for country and southern rock, though I'm sure others could find other uses for it. The Custom coil is a bit bright and twangy compared to a lot of the videos, but not unmanageably so, and with the right eq settings is BEAUTIFUL.. (very minor tweaks of rolling off the treble just a bit). This coil is wonderful. I can only wonder how good the two would sound in the neck position. With clean settings, or just a bit of drive to where it's almost on the verge of breaking up it is still very beautiful, and "soulful" (if you will). The '59 coil starts a beautiful chain of feedback if you position it next to the amp with just a bit more drive than "just on the verge of breaking up"... On the other hand, the beautiful sound of the Custom Coil starts to show it's aggression a bit more here, while still retaining it's beauty... kinda a weird mix of "beauty and the beast" in one single entity... twisted, but WONDERFUL...somehow (I know, disturbing image, but you get what I mean here... sonicly aggressive, yet still has it's ornate beauty). It's parallel wiring together here is... out standing. A wonderful mix of both of these qualities. When you get in to "medium" amounts of gain, this is where the '59 becomes it's southern rock self, and let's it's hair down. I'm thinking Alman Brothers, or Lynyrd Skynyrd. The Custom Coil here, starts to show it's animal side, snarlling back at you like some crazed puma... and if you dare put this through a mesa/boogie triple rectifier type amp.... yea you're not poking a bear, you're kicking a demon... as this thing will start to roar at you with pitch perfect accuracy in ways that... well I'd imagin a succubus might... As I have falling into full blown obsession with the custom coil in this sort of setting... and I don't know when I'll come down from this near orgasmic and quite cosmic high ;). As for the mix of the two here in parallel... Not as good for my uses, but I can see it being a twangy fun thing for someone, the mixing in of the '59 coil here is too twangy for my liking with that kind of drive. Overdrive... the '59 becomes a southern rock beast here, or can do justice to some types of shred. The Custom on the other hand... has a full pleathera of different tonal options that open up here depending on the amount of gain... I don't recommend max. gain for anything including this pickup... in any form, BUT... it does have a nice beadroom sound that will wake the dead and bring forward the arc angels ;). As far as ease of instillation, it's as simple as soldering gets... Though the wire they use is really to small, it needs a lower gauge. I found them breaking tooooo easily, but then this is my first electronics project. The manuf. Support is awesome, just shoot an email or call em and they will help. Quality wise, yea, needs thicker gauge stranded wire but other than that it's a breeze. Style of Music: Everything...except "christian".